Super Combiners - SERIES 2! IT IS HERE! All four of the Series 2 Super Combiners are ready for their PDF debut! Pictured below is the fourth member of the combiner crew, GRP-S (Grips). Click Read More to see more details and to see how to acquire these bot patterns! Here is a very simple flying toy. Just like with the classic fold-and-tape paper airplane design it is based on, this simple flying ring is thrown straight ahead and given a little spin. You don't need to throw it hard, and you don't need to spin it too fast. A gentle forward throw will make the vortex flyer travel in a straight line more than 12 feet (3.65 meters)! 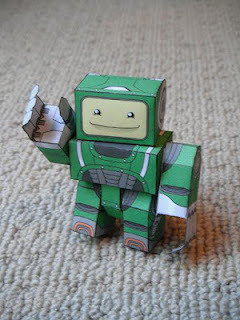 This paper toy is light enough for safe, indoor play. 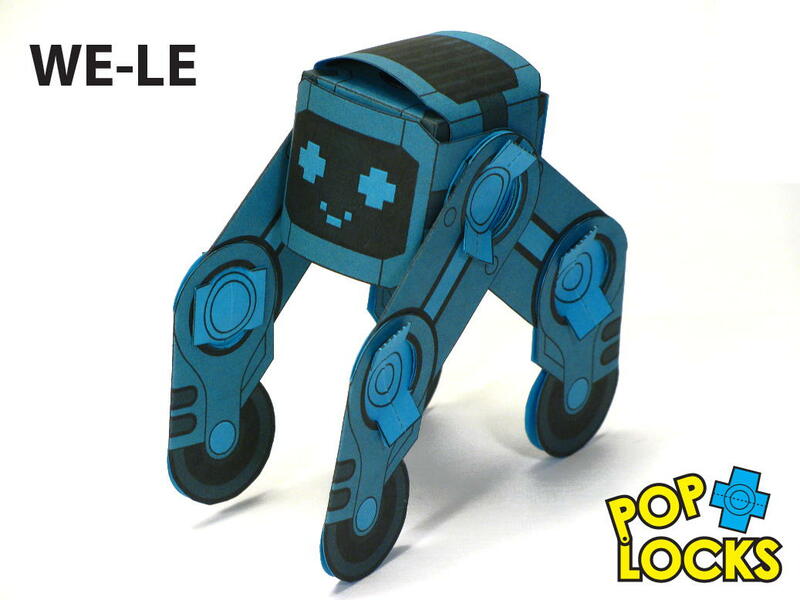 Build this really easy paper toy with pieces from the free Poplocks Free-forms template and the free Page of Poplocks. Click Read More to see the instructions. 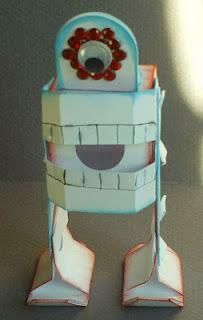 And here's SK-8.... oh wait a minute... this is a very similar but completely different little robot! It's WE-LE ("wheelie"), the robot who likes to dance on it's four wheel/legs and beep out songs it makes up on the fly. Maybe there is a limit to how bright and cheery a robot should be. WE-LE will be the third robot in the second Super Combiners set. Number 4 is coming up soon! Poplocks Free Forms are a very simple set of shapes that can turn paper into all types of fun toys! 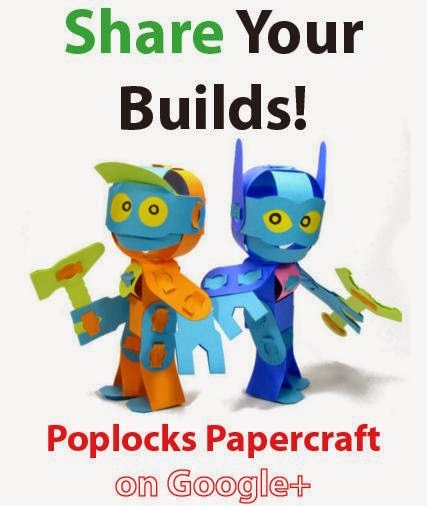 Download the PDF - print out the sheets you want on thick card stock - cut out the parts and connect them with Poplocks to create toys that are easy to assemble and customize! Keep checking this blog for new toy ideas made with Free-Forms! Click here or "Read More" to download the Free Forms PDF and for detailed instructions! Do you need a bunch of Poplocks, now? Print out these pages of Poplocks Slims and get your scissors cutting! You can choose the basic circle-pattern or use the blank design, all in the same PDF. Print these on US Letter or A4 paper sizes -- no re-sizing necessary! The pages are black and white line art only, so print these out on color card stock, or open the PDFs in your favorite, compatible vector art program to make your own Poplock patterns. Poplocks can actually have different shapes. These slimmer Poplocks work just as well as the previous design. More can fit on a page now! These sheets of Poplocks are designed to be easier to cut out too! Paper crafting friends are great! They don't need to go to the store to get you a birthday card. Instead, they make even cooler cards like this one above! 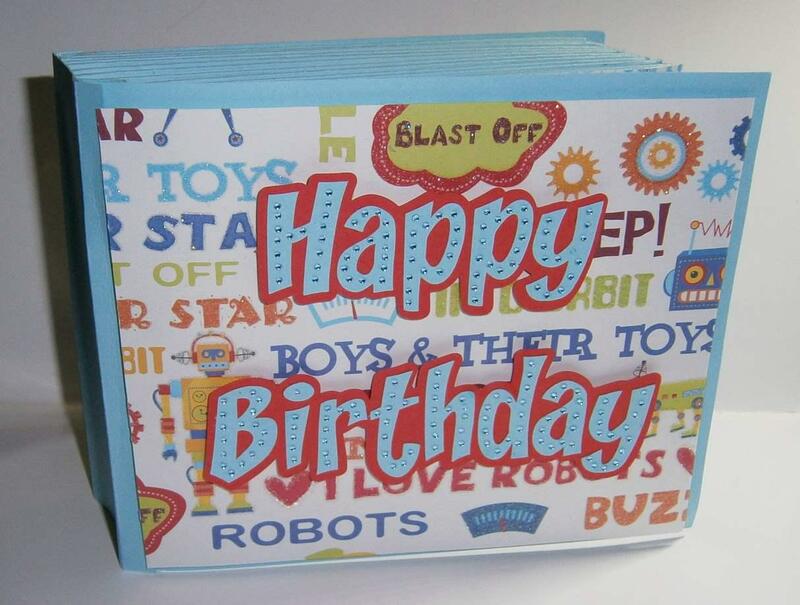 Tracey knew her friend Susan loves robots, so she included both of my Pocobots inside of this deluxe birthday card. I am happy that my robots were well-received! 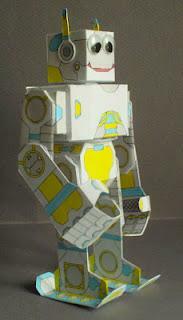 See more of the incredible projects that Tracey does at her blog, Adventures in Papercrafting. 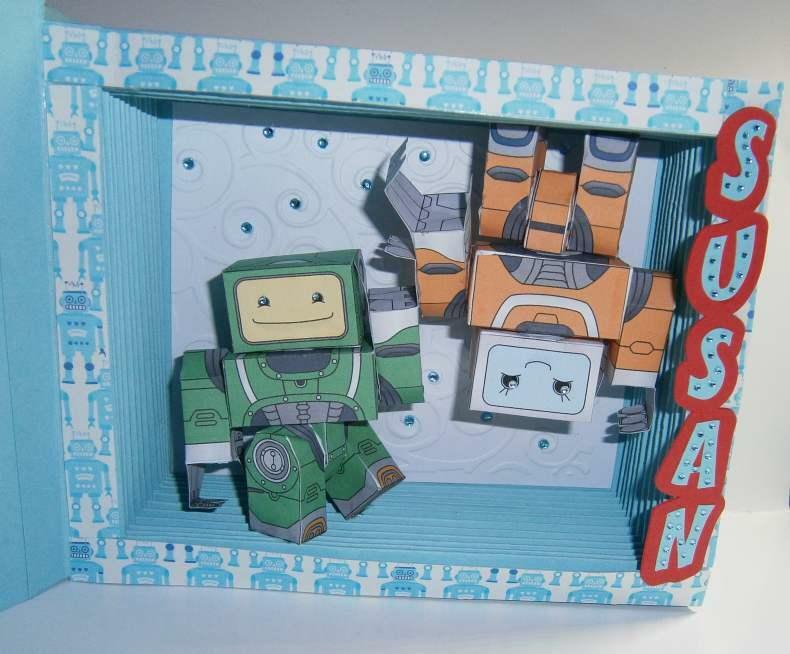 Susan's blog is also chock-full of paper crafty goodness at Susan Blue Robot. 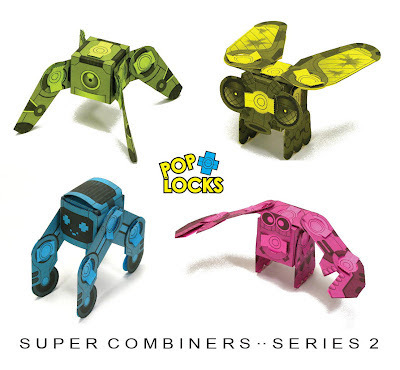 Pocobot, Sweet Robo, and the Poplocks Super Combiners make great gifts. One sheet of card stock paper and a little bit of your own time will show you care! It's been a while, but here's the first of four new Poplock Super Combiner Series 2 bots. ZP-R (zipper) has giant, compound eyes and is very swooshable when you fold back the wings. In a week or two, I'll have a photo of the next one up, and each of the last two will show up shortly after. In the meantime, click on the link below to get ZP-R for free! Series 2 will have a couple of pages of bonuses as well, wait till you see! Fresh off the assembly line, it's the Poplock Freebie pack, number 3! 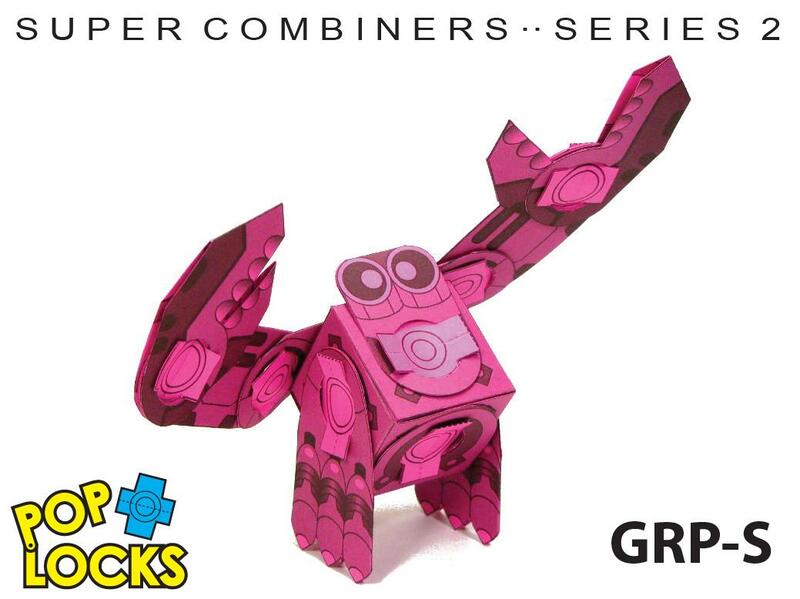 This one-page set features two new Face Blocks with two new sets of legs and both leg sets are easily used to augment the details of larger robots from the Super Combiners Series 1 set. Print out these characters on thick card stock. I used 65 lb. 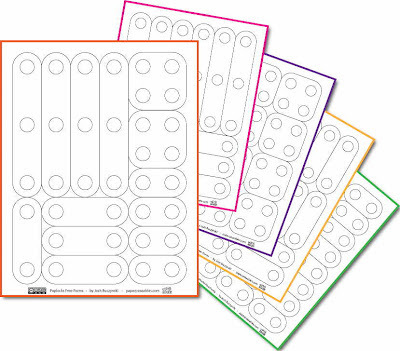 color card stock for these bots, but you can use plain, white card stock too. Easier to use markers or pencils to color those bots! This is Rn-dR (Run-deer), my first Super Combiners 3-page build. 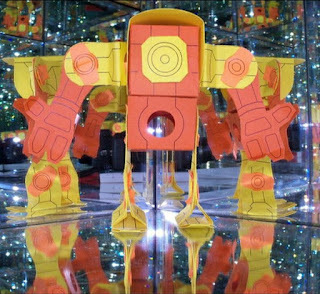 I combined 2 orange and 1 yellow R-MZ bots to make this long-legged loper. Another feature that keeps this creature standing tall - a single foot/antenna piece acts as a support strut between each set of legs. This gives Rn-dR a springy way to stay upright. Zoom in on the pic above to see the strut located between the front legs! Rn-dR has more than a little skill in balancing. Okay, that's enough showing off now. Can you do anything useful? The Face Blocks enjoy a quick mode of transportation. Get a copy of the Poplocks Super Combiners Series 1 collection and you can make your own Rn-dR, or try to make something even bigger! You can purchase and download these templates by clicking the button below. You get four robot templates plus a page of bonus parts! Print out as many as you can make! Even more images from Susan Blue Robot! I am completely delighted by the work she has done on these bots. Be sure to visit her blog to check out more Poplocks pics and to see all of her other fine creations! Microbot! 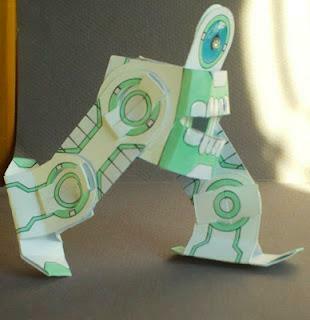 From "Build Your Own Paper Robots"
Jim Camenga found a most interesting way to capture every angle of his Gupp-E toy! I want my next apartment to have all walls with mirrors like this! Here comes the second set of freebie Face Blocks! More parts are packed on this sheet, giving each Face Block four poseable feet! These blocks are, again, based on the RM-Z template from Super Combiners Series 1. This PDF is seriously PACKED with parts, but don't worry, all of the parts are margined to print out on US Letter or A4 sizes of paper. Use two feet together to make a gripping claw for larger bots! Susan BlueRobot has even more pics of her 2-PH builds! 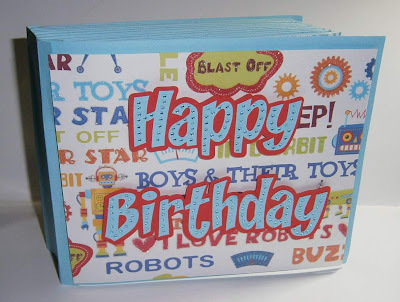 Marker, Embossing and Cutting tools were programmed to shape and remove these forms from card stock. It's exciting to see these patterns modified so much! Visit Susan's blog to see all of her other varied paper creations. More to post soon! Susan BlueRobot does some very awesome papercrafting. Check out her blog in my Paper Toy Links below - she is a great experimenter and tries out all sorts of advanced techniques. Susan turned my Pocobot pattern into a machine cuttable pattern and printed, scored, and cut it out on her Zing cutter/plotter! Both Pocobots are custom colored and patterned and have cool 3d elements making up their faces! I love it! I can't wait to see more. You can see more on Susan BlueRobot's blog. If you use Inkscape to design your patterns, you are going to find lots of inspiring projects and tutorials! More free Poplocks toys for you to download, print and build! This is the Face Blocks 01 set, and it's pretty simple - you get parts for building two blocky faces. The construction is different from the body block on 2-PH as these blocks are made with two pieces. Why two pieces per body block? More parts can more easily fit on a single page! Build body blocks made with two colors! 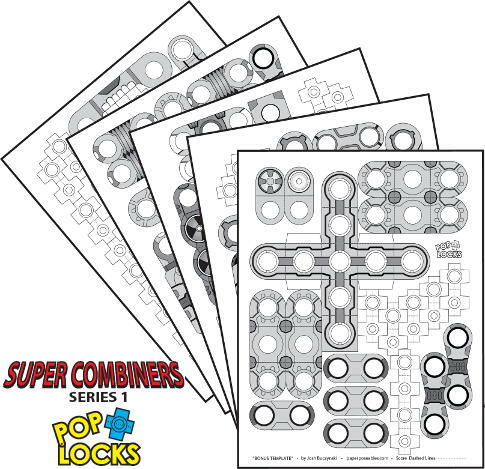 With the release of the Poplocks Super Combiners PDF (only $2! ), there's more to build now! And lookee here, it's another double build - this time, with the R-MZ paper toy. Normally, he's a pretty stand-up guy, but when you combine two R-MZ (Arms) and put on their eye mask, they assume the role of R-MND-0 (Armando), the annoying practical-joke-playing robot that shows up at parties uninvited. R-MND-0 can be a real pest. He sneeks up on his monocular brethern and surprises them with a hug. Sadly, R-MND-0 isn't programmed to be aware of personal space and doesn't have appropriate force sensors on his arms... the unexpected can and does occur. 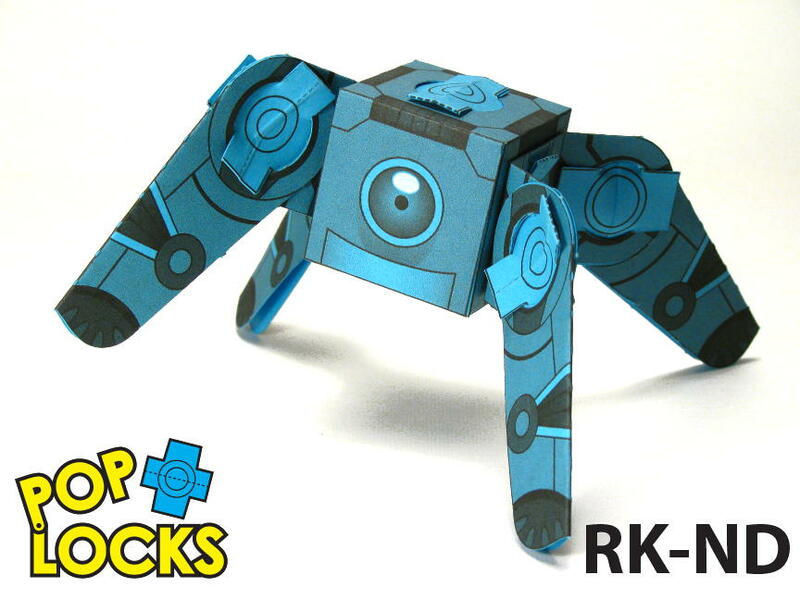 You can print out and build your own R-MZ Poplock bots and combine them to make your own R-MND-0! For only $2 gets you all four Series 1 Super Combiner bots plus a bonus page of parts. Check out the details by clicking on the icon below. What can you build? Rob Ives, famed paper engineer and automata designer, has put his tools to work making dinosaurs of a poseable nature. Check out these beasties here -Tyranosaurus Paper Toy - and here - Apatosaurus Paper Toy ! These dinos are really cute and super poseable! I'm glad I have a membership to Rob's downloadable projects! Get yourself a membership too! a bonus pages of parts including 2 rotating connectors and 4 cube connector bars. I'll email the PDF file to you soon after you order. Once this operation gets bigger, automated downloads will become the standard. I recommend using 65lb. or heavier colored card stock. 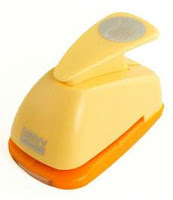 You can buy this at your local craft store or office supply store. Print out as many as you want! Make super combiner bots as BIG as you want! It's another Toof Combiner toy - Noslon has a giant sensory apparatus not unlike a nose, used for detecting all sorts of things. As you can see though, no mouth! I just need to make a small extender piece that allows the mouth to sit comfortably between two cubes. Isn't it interesting how a foot can become a nose, just because of where it's placed? Surprised me too! Next up, a multi-Toof build using three Toofs! Remember, this is a toy you can download and print out as many times as you like! Why stop at three? "Ya smell sumtin dere, Nosey?" Large Skull Head monsters from the indie game, Super Crate Box by Vlambeer. 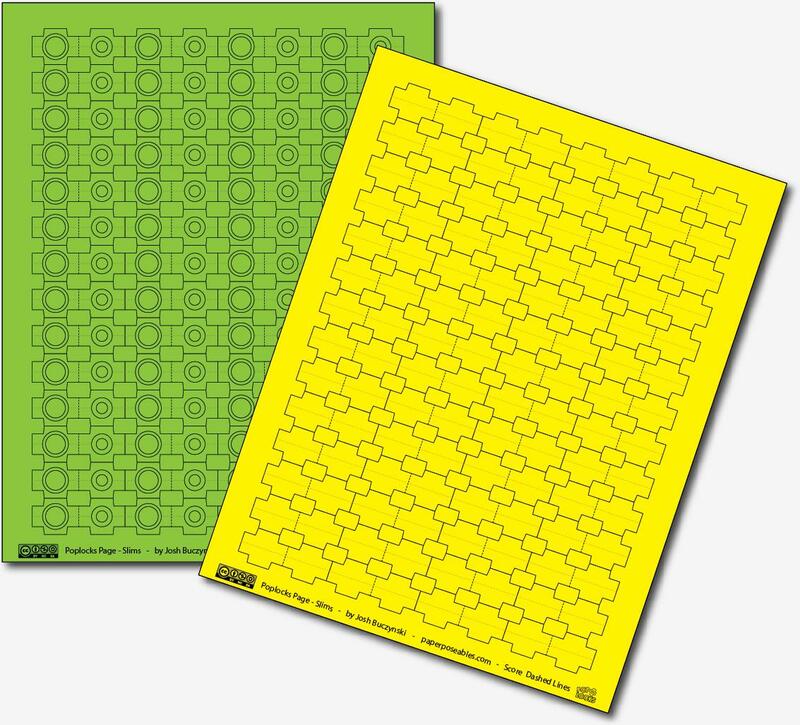 Each one is just one sheet of paper (fits on US Letter or A4! ), and they use elegantly simple rotational pivot tech designed by Alexander Gwynne. Use two 2-PH sheets to make the menacing MEGA TOOF! 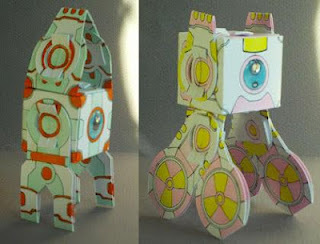 Ken was awesome enough to post images and reviews of completed paper bots on his blog, SuperMega.tk. There are two firsts here: the first image of a Chompy Bot to appear on the web and also, the first critiques of my models. Thank you for both, Ken! When Alexander Gwynne and I developed Poplocks, this is one of the concepts we started with - taking two individually designed models and being able to swap the parts with each other. Here, you can see 2-PH and R-MZ kludged together to create something more... well, "something" for sure.